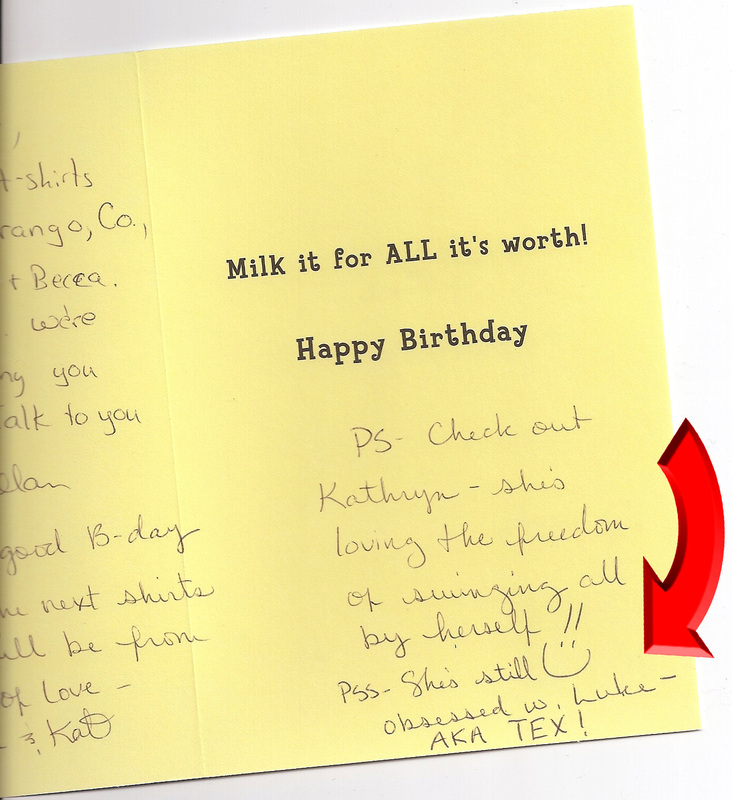 TEX by Dorie McCullough Lawson Featured at Bradford Brinton Memorial & Museum Birthday Celebration! The Bradford Brinton Memorial & Museum in Big Horn, Wyoming, is celebrating founder Bradford Brinton’s 132nd birthday on June 26, 2012, with free admission all day, and cake and ice cream on the grounds from 2:00 p.m to 4:00 p.m. Spend the afternoon at the museum, enjoy cake and ice cream, and meet the author of TEX, Dorie McCullough Lawson, who will be signing books from 2:00 to 4:00 p.m.
TEX by Dorie McCullough Lawson is available for purchase at the Bradford Brinton Memorial & Museum, and from the TSB online bookstore, where shipping in the US is always FREE. TEX by Dorie McCullough Lawson has remained a favorite in our household, and a pleasant respite from the planes, trains, and automobiles that dominate most of my son’s reading preferences. How wonderful is it to spend a few minutes of quiet lost in time and place as “Tex” stomps around his ranch and takes care of business? Yes, we are all still obsessed with TEX. The kids I know are still obsessed with TEX! Calling TEX by Dorie McCullough Lawson “A delightful and heartwarming story that appeals to both young and old,” the TACK (Tack-Apparel-Culture-Knowledge) Blog, a cool new site where people can learn details about all different equestrian products and happenings, highly recommends it–as a present, or even for your own book collection! Check out the full review of TEX, and other product reviews and industry events on the TACK Blog by clicking HERE. TSB author Dorie McCullough Lawson is featured on an episode of Horses in the Morning and The Stable Scoop Radio Show on the Horse Radio Network, the largest radio network devoted to horse lovers! There she talks to Glenn the Geek and Helena Bee about growing up the daughter of two-time Pulitzer-Prize-winning historian David McCullough, being “horsey” in an “unhorsey” family, and how the photos and and story behind TEX came to life. “If you have a little kid who is a little bit Western, or a little bit horsey, this book is for you,” says Glenn the Geek. “It is absolutely adorable, and it gets Five Flakes out of Five Flakes [Horse Radio Network’s highest rating] for a children’s book.” Glenn recommends it as the best kid’s Christmas gift! CLICK HERE to listen to the episode, which also features a look at the Rose Parade and an interview with the All American Cowgirl Chicks—the interview with Dorie starts at 24 minutes in. You can still order a signed copy of TEX and get it in time for Christmas! It’s available from the TSB online bookstore where shipping in the US is always FREE and where you can get 15% off your entire purchase now through the holidays! Plus, 10% of all TEX sales via the TSB website through January 1, 2012, will go to support the Pajama Program, which provides books and warm pajamas to the children who need them most. You can find out more about TEX and TSB’s donation to the Pajama Program and how you can get involved by clicking HERE. 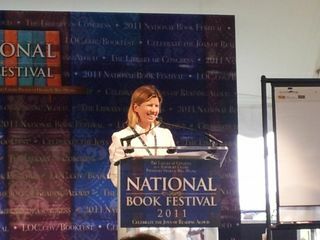 Dorie McCullough Lawson, author of TEX, at the 2011 National Book Festival. Levenger Press: How did you come to be such a thoughtful champion of children’s reading? Dorie McCullough Lawson: I was lucky to be raised by parents who love books. My mother has always said, “If you can read, you can do anything.” When you grow up hearing that, you know books are powerful things. As a child I was read to, I read on my own, we talked about books. The characters and scenes from books were simply a part of my life and consciousness from the beginning. And I’m sure it had an effect knowing that books were being written right there at home, by my father. Something else that was important: from about third grade on, my friends and I talked about books. I still remember which books we read. Once my friend Shannon and I were both crazy about a book called The Blind Connemara, and the school library had only one copy. It was quite a war over that book! LP: Many advocates of children’s reading believe that as long as kids read something—anything—it’s a good thing. Do you agree? DML: I disagree. There are so many wonderful books out there that in a lifetime we couldn’t read them all. There just isn’t time or brain-space to waste on anything that isn’t terrific. It’s true at any stage of life, but especially in early childhood, because what we read and put into our brains during that precious time tends to stay there forever and in turn influences who we are. Read the rest of the interview with Dorie McCullough Lawson on The Well-Read Life by clicking HERE. Copies of TEX Signed By the Author Available for the Holidays! Order your signed gift copy of TEX at http://www.horseandriderbooks.com. Here’s your chance to get the perfect gift for the youngster in your life–whether your son or daughter, grandchild, niece, or nephew–a beautifully illustrated storybook about imagination, the great outdoors, and the value of hard work. 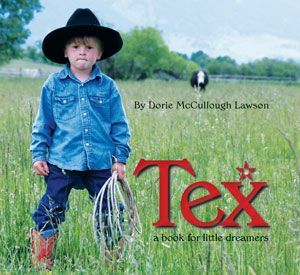 Order your gift copy of TEX by Dorie McCullough Lawson, signed by the author, from the Trafalgar Square Books online bookstore, and 10% of your purchase will go to support the Pajama Program, a nationwide organization that provides warm sleepwear and books to the kids who need them most. Read more about TSB and TEX’s contribution to the Pajama Program HERE. 10% of all TEX sales at http://www.horseandriderbooks.com through January 1, 2012, are going to support the Pajama Program. Dorie McCullough Lawson and TEX Talk about Imagination with First Graders–Plus, Great Book Signing Events in Massachusetts! 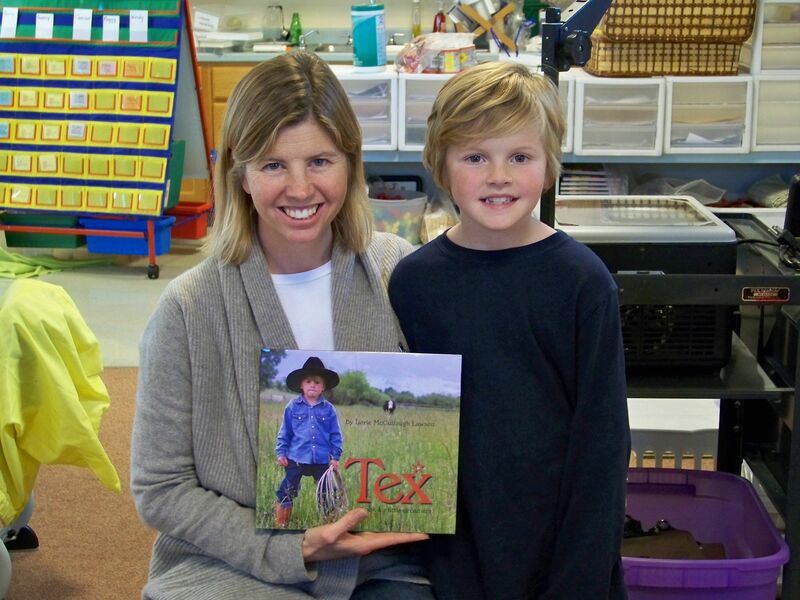 Author Dorie McCullough Lawson and her son Luke shared her children's book TEX with a local first grade class. This month Dorie McCullough Lawson, author of the wonderful new children’s book TEX, not only had terrific book signing events in Dedham and Vineyard Haven, Massachusetts, but she and her son Luke (the young star of the story) also visited the first grade class near their home in Maine. There, they shared the story behind TEX and talked to the students about imagination—what did they think about or “picture” when they closed their eyes? 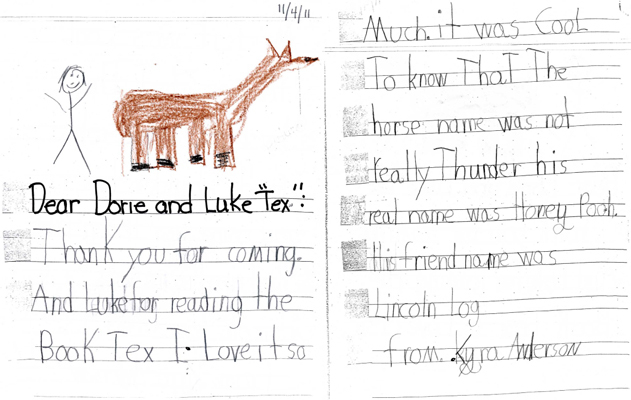 In TEX, Luke imagines he is a cowboy, with important jobs to do on the ranch, his own cowdog, and a horse named Thunder. The students’ responses ran the gamut, from imagining they were monster trucks, to wishing they were warriors, to pretending they were princesses. TEX offers great opportunities for parents and teachers to introduce central themes, such as imagination and hard work to youngsters from ages 2 to 6. Its authentic, colorful photos of a tiny cowboy stomping around the American West capture the hearts and minds of young readers and little dreamers everywhere. You can buy your copy of TEX at the Trafalgar Square Books online bookstore (click HERE), where shipping in the US is always FREE. 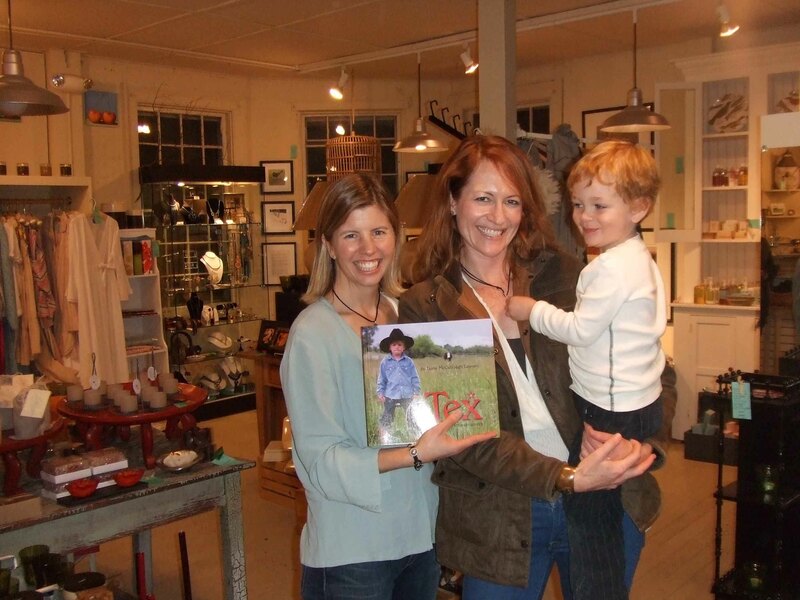 Trafalgar Square Books Senior Editor Rebecca Didier with her son Augustin at Dorie's book signing event at Nest in Dedham, Massachusetts.